Pete Thomas is an intriguing quarterback prospect with a history reminiscent of former pocket passer- Pitt QB Tom Savage. A rare 2 school transfer, Thomas’ long march originally started with the Colorado State in 2010. He’d spend two years with the Rams and play in 21 games. Pete put up a decent statline, going 414/652, for 9117 yards, with 36 TDs to 36 picks. 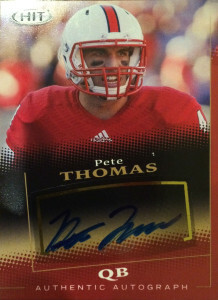 Sitting out a year, Thomas played in 9 games in 2013 for the NC State Wolfpack. He’d throw 9 TDs, and complete 149 of 247 attempts. Thomas again changed gears after the 2013 campaign, and transferred to Louisiana-Monroe. Pete had a good year with the Warhawks, with 301 completions on 501 attempts, 3181 yards and 14 touchdowns. Going undrafted in 2015, Pete was an early mini-camp arm for the San Diego Chargers and New York Giants, but was unable to stick. Eventually Pete signed with the Minnesota Havok of the Indoor Football League, but the team folded before it even took the field. Released from his contract he was assigned by the Arena Football League in 2016 to the LA KISS. Thomas came in during the first game of the 2016 season and didn’t relinquish the starting job all season, leading the team into the playoffs. Pete for the record completed 166 of 294 attempts for 2094 yards, 42 TDs and 8 INT. As the Arena Football League went through a massive reorganization the LA Kiss bowed out of the league. Thomas had his rookie option exercised by the Tampa Bay Storm for 2017.